Posted May 29th, 2015 by admin & filed under Elbow, Hand/Wrist, Shoulder/Neck. 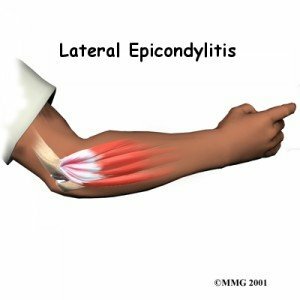 Let’s talk lateral epicondylitis, better known as tennis elbow….what can I tell you that you haven’t already looked up? Here’s a review anyway…lateral epicondylitis is an inflammation of the tendons of the wrist (extensor) muscles. These are the muscles on the outside part of the forearm that move the wrist up. Most people can have pain right on that outer part of the elbow. It tends to an overuse type of injury occurring majority of the time in the dominant hand and effects ages 30-50 the most. It can also cause pain in the inside part of the elbow, which is referred to as medial epicondylitis as known as “golfer’s elbow”. 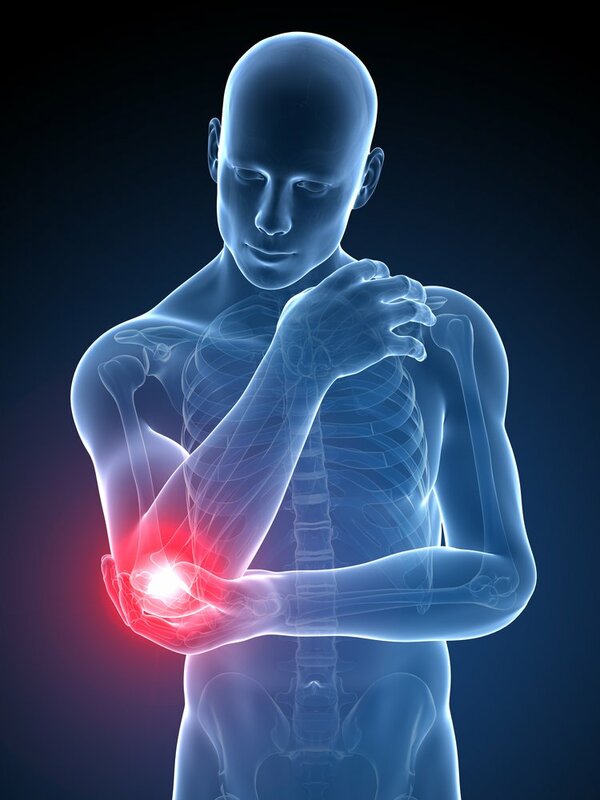 Most people report of pain that shoots down or up their outer forearm when doing something heavy or functional like grabbing a carton of milk or something light such as writing. In this day and age most people look up different sites like WebMD and Wikipedia for medical questions about what is going on with them before even going to a doctor! I know a lot of people personally that just want to figure out for themselves what to do and see if they can self-treat because going to the doctor or therapy is time and money. If the pain is not that bad, then why not you ask? For the most part, it’s fine but what tends to happen is the pain may stop for a little but then return much worse because the root of the problem hasn’t been fixed and the behavior has not changed. Well, when something that you are doing hurts, stop doing it. But how can you rest and not use your hands? You can’t. That’s why people tend to get worst. One of the things that I like to tell my patients is lets’ modify your activity if you can or reduce some of it to give your hand/arm a much needed break. Body mechanics is huge when trying to reduce pain but still needing to use your arm and be functional. When carrying anything, hold it with your palms up instead of down because that causes you to use those painful muscles causing more pain. Don’t grip heavy items such as carrying in all your bags of groceries at once. Try not to do anything where you are holding anything for long periods of time such as cutting veggies or meat. The other key treatment recommendation I give is to use ICE. Use ice when painful. Use ice when you just can’t seem to give your arm a break because you still need to live and function. Ice the painful areas at least 2-3 times daily for 10 minutes or until the area gets numb. The biggest challenge I see when icing is that my patients don’t know how cold it’s supposed to be. It’s supposed to be COLD and uncomfortable, but then it goes numb and that’s when you are done. Use a pillow case between you and the ice, not a towel…that towel will never let enough of the cold through. The pillow case is a barrier so that you don’t get burned by the ice because in some cases that can happen. Those are the biggest 2 tips that I can give you. Of course there are a slew of products people buy and use such as braces, air cast braces, and creams. Do they help? Maybe. Maybe not. I would recommend going to a certified hand therapist though if you can before it gets worst getting a good stretching program and strengthening program. Checking the shoulder is a key component as well to making sure you get rid of the tendinitis and keeping it away. If it’s not a bad case of tennis elbow, I usually recommend only 1-2 sessions at the most to teach a really good home exercise program. The hardest thing about that for people is to actually do it. Once it gets worst and the pain is there all the time with even the slightest grip and use of the hand…well that becomes a whole other story. Call us at Hands on Therapy Services for your evaluation today. Thank you! Please sign up for our newsletter or follow us on social media for even more information! I hope you and your neighbor found what you were looking for to help. Best wishes!